"Only 1-5% of patients who have had a stroke have access to acute interventions like thrombolytic therapy, clot-buster medication, or intravascular treatment. 1-5%; that’s a minimum. So the question is what happens (and what can be offered) to the rest of the patients? Part of my program is to take care of the 95% who don’t have access to those acute interventions." 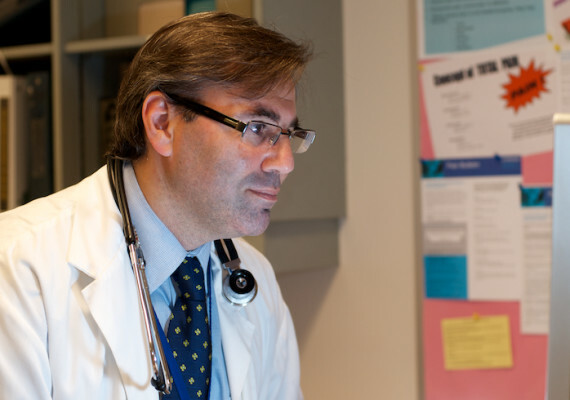 Dr. Saposnik is the Director of the Stroke Outcomes Research Unit, Mobility Program, at St. Michael’s Hospital. He is an Associate Professor in Medicine with a cross-appointment in the Institute of Health Policy, Management and Education (HPME) at the University of Toronto, and is an adjunct scientist at the Institute of Clinical Evaluative Sciences (ICES). He is the principal investigator of multiple Stroke Outcomes research studies coordinated through the Applied Health Research Centre (part of the HUB Health Research Solutions). Currently, Gustavo is completing a PhD in Neuroeconomics (Decision Neuroscience) at the University of Zurich, which is expected to foster his and his team’s research. The following interview has been edited for clarity and brevity by Dot Myers. My area of research focuses on Stroke Outcomes & Decision Neuroscience, which are relatively new areas of research that tries to tackle the well-being of stroke patients by attempting to incorporate the different perspectives from policy-makers, physicians, healthcare providers and the patient. Through population research, we’re trying to identify and understand the end result of different interventions, processes of care, and medications that may help stroke survivors to feel better. Decision Neuroscience is the field that seeks to understand how we make decisions applying principles from behavioral economics and neuroscience. I think that the combination of Stroke Outcomes & Decision Neuroscience research is an interesting niche. Part of my program is integrating the combination of stroke, perspective of outcome research, rehabilitation and technology. I saw this as an interesting and innovative approach, since most patients who have had a stroke want to feel better and there are several limitations in terms of stroke care. Firstly, only 1-5% of patients who have had a stroke have access to acute interventions like thrombolytic therapy, clot-buster medication, or intravascular treatment. 1-5%; that’s a minimum. So the question is what happens (and what can be offered) to the rest of the patients? Part of my program is to take care of the 95% who don’t have access to those acute interventions. Secondly, most people who have had a stroke receive conventional rehabilitation to help them get better. The problem with conventional rehabilitation is that it’s time consuming, it’s tedious, it’s boring, and it often provides a relatively low reward. More novel interventions are needed. We need to utilize different technologies that apply the important principles of neural rehabilitation to make the patients feel better, and to ultimately offer a better reward and provide rewiring in terms of brain plasticity. Finally, the novel field of neuroeconomics helps the integration of medical decisions and patient-centered outcomes by facilitating principles from behavior economic, psychology, and game theory to better understand how we make decisions. That’s a great question. I think that there are personal, local, and external factors. The personal factors require imagination, passion and dedication to do whatever your goals are. I don’t feel that I am working, basically. I really enjoy what I am doing every day. In summary, I think passion, collaboration, generosity, a balanced life, and commitment are key personal factors that may contribute to what people call success. In terms of local factors, we can’t be successful by ourselves. We need a group, a network, and teamwork. And this is something that has been facilitated at St. Michael’s. I’ve had impressive support from my colleagues, Dr. Tom Parker (physician-in-chief), Dr. Dan Selchen (division head) and from Muhammad Mamdani and the AHRC, from both clinical and research perspectives. I should also mention the long list of fantastic advisors (Dr. Joel Ray, Dr. Tom Schweitzer, Dr. Sandra Black, Dr. Clay Johnston, and Dr. Andreas Laupacis, among others). I think these are important factors for any researcher’s success, especially those who are involved in clinical research. Lastly, key external factors are interactions with colleagues and networking. A good example is an international group of collaboration in the area called Stroke Outcomes Research (www.sorcan.ca). Furthermore, getting along with people is another key factor. I can’t see anybody in this world achieving success if they can’t get along with people. It’s obvious today, but it was not that obvious 10 years ago, at least not for me. I write and work on controversial topics that generate ideas and conversations that may take some time to be settled or agreed upon by other researchers. So, I’m not sure that there is a single study that has caused the greatest impact on my career. When I look at my most cited work, the work that I’ve done and found funding for, it’s mostly in stroke rehab, applying technologies to improve rehabilitation of stroke patients, despite the fact that I’m not a ‘stroke rehab guy’. Other examples include the following studies: i) the weekend effect on stroke outcomes, ii) higher risk of vascular events during your birthday, iii) the development of a risk prognostic score for stroke, iv) direct involvement in American Heart Association Guidelines. I recently asked the same question to the editor of Stroke, actually, about how to define success. In my view, it’s very difficult. Different people have different definitions of success. I heard a reporter from CBC ask one of the former mayors of Mississauga, she’s 91 and retired now, but she was asked how she defined success. She defined it simply as listening to people. I can connect with her answer, because I think it’s important to listen and understand why patients really seek care. Patients seek care because they want to feel better. And feeling better may come from an intervention, or maybe just listening to them, it depends. I think that a key factor of success in research is discovering strategies that help patients feel better at the end of the day.